These practice problems convert values within the customary or imperial system using unit fractions and unit cancelling. 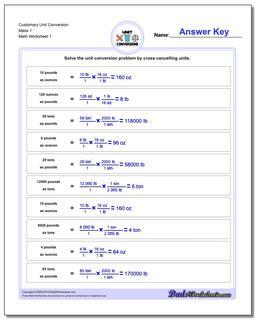 There are sets of worksheets coverting length, mass and volume conversions. Each worksheet includes an answer key that shows multiple steps where required to convert within the measurement system to practice unit cancelling when solving a conversion problem. 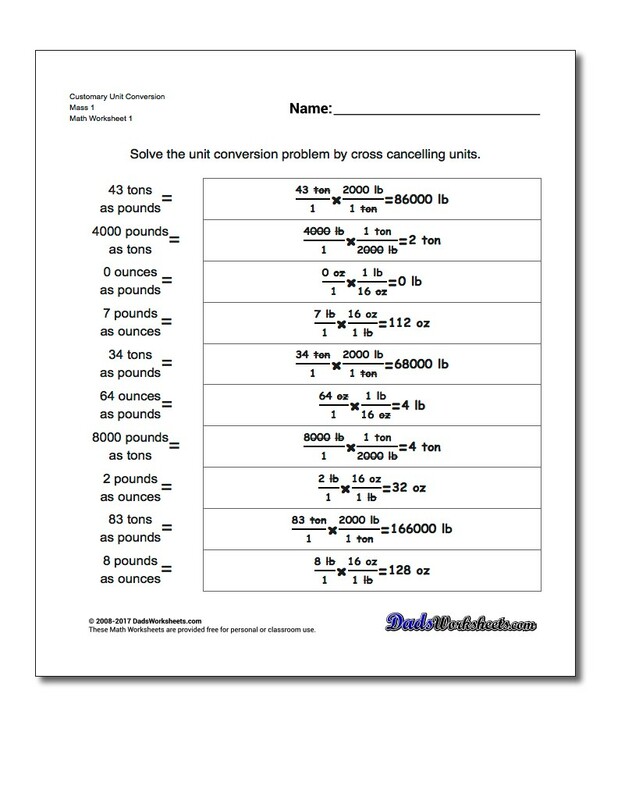 Unit conversion worksheets for converting between customary distance units, including inches, feet, yards and miles. Unit conversion worksheets for converting customary volume units, including ounces, pints, quarts and gallons. Even with the standardization of the metric system, customary units of measurement are still widely used, especially in the United States. The customary measurement system is somewhat more complex and requires memorizing a number of important facts to make conversions happen. The worksheets in this section provide plenty of practice converting between customary units of mass, volume and distance. There are several facts that must be memorized to convert between customary units of distance measurements. There are exactly twelve inches in one foot. There are three feet in a yard, which means there are 36 inches in one yard. And there are 5,280 feet in a mile, which (divided by three feet per yard) means there are 1,760 yards in one mile. You can use these facts to convert inches to feet, feet to miles, yards to miles, inches to miles or anything in between.The first set of worksheets in this section deal with these distance conversions, all of which start with inches to feet and feet to inches as their base. To convert customary units of mass, you must memorize that there are sixteen ounces per pound, and 2,000 pounds per ton. The ounces unit in customary measurement is not the same as that used for volume. Even though an ounce of water has approximately on ounce of volume, that's more of a coincidence than a fact to be relied on, and other measurements of other substances will show that fluid ounces and mass ounces are not interchangable. The worksheets in this section deal with converting mass units and focus on practice problems like converting ounces to pounds, pounds to tons, ounces to tons and similar conversions. Units of volume in the customary measurement system are complex. There are eight ounces to one cup, two cups per pint, two pints per quart and four quarts per gallon. Converting between units that are far apart on this scale requires multiplying a large number of constants, for examples to get fluid ounces to gallons the conversion is (8x2x2x4) = 128 ounces per gallon. Because of the number of small units of measure, converting between customary volume units requires diligence. These worksheets deal with ounces to gallons, quarts to gallons, pints to gallons, gallons to ounces and many of the other variations of volume conversion.